Matthew R. Kerns joined the Arts and Education Council in November 2017 as manager of grants and programs. In this role, Matthew is facilitating the productivity and efficiency of A&E's grants and program needs. He is also responsible for managing the current programs of A&E, including planning, curating and implementing activities in the Catalyst Innovation Lab. Matthew also serves as executive director of St. Lou Fringe and is the founder of The Drama Club STL. 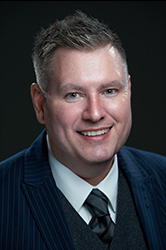 Kerns has held a variety of arts and nonprofit positions including director of community engagement and programming for Grand Center, Inc., director of education at Theatre Cedar Rapids and adjunct professor of theatre at UMSL. He holds a masters of fine arts in contemporary performance from Naropa University and a bachelor of fine arts in acting from Eastern New Mexico University. In his free time, Matthew enjoys seeing friends and family, taking in some of our city’s amazing art offerings and spending time with Tuxedo the cat.